Welcome to a little Rustic Elegance in the heart of Wentzville! This Custom Built 1.5 story is a little over a year old and is packed with character including Gorgeous Hardwood floors through out, Formal Dining Room, Gourmet Kitchen w/Subway Tile, Stainless Appliances and large kitchen island with Custom Cabinetry, Ceramic tile in most bathrooms and Laundry. Over sized 3 car garage, Fully landscaped, and includes irrigation system. 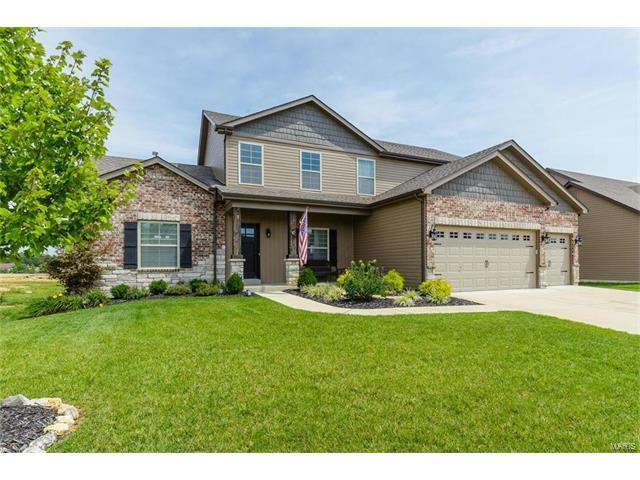 Upper level has large loft overlooking 2 story Great Room, and 3 additional Bedrooms. Main Floor Master Bedroom Suite has DOUBLE walk in closets leading to Luxury Master Bath with Separate Sinks, Private Water Closet, Soaking tub and Beautiful Shower. Walk out lower level has 9 foot pour, lots of windows and bathroom rough in, leading out to Fully Fenced back yard with large Deck. Keep home cooler in Summer and Warmer in winter with Dual Systems, each with The Nest thermostats you can control with phone! Don't hesitate or this BEAUTY will be GONE! Wentzville Parkway to W Meyer Road, to approximately 1.5 miles to left on Miranda to left on Dalton Court.